Quality reporting has become an essential task for physician practices and will only become crucial as the link between reported outcomes and financial outcomes solidifies. Bergein F. Overholt, MD, FACP, MACG, of Gastrointestinal Associates in Knoxville, Tenn., explains how his practice and its ambulatory surgery center have created a system for effective quality reporting and improvement projects. Question: What system or process do you use in measuring and reporting quality data? Are PQRS measurements met by this system? Bergein F. Overholt, MD, FACP, MACG: Our practice and ASCs have developed a comprehensive quality and value program that uses GIQuIC and gMed for reporting quality data. Physicians and staff work within this program to input data to GIQuIC for analysis. The resulting information is downloaded to our practice and used for internal assessment. PQRS reporting is met by GIQuIC. CMS has labeled such registries as GIQuIC and DHRP qualified clinical data registries. Q: Are the new CMS ASC measures #9 and #10 measured and reported by the system you use? BO: CMS ASC #9 and #10 data is captured in part by GIQuIC, but the CMS regulations require facilities to report these measures via a website administered by CMS, resulting in additional and significant manual effort to complete. The professional societies are currently urging CMS to incorporate the use of registries to achieve ASC quality reporting requirements so we in practice don't have to report the same data different ways, which requires duplicate effort and greater time. Q: What are important steps for a practice/ASC to consider in developing a quality reporting system? • Commitment to quality by the physicians, practice and ASC is the one critical and essential component of a Q&V program. • Physician and administrative leadership. There has to be at least one "champion," particularly among the physicians. • Allocation of staff. At least a half to one FTE computer-skilled nurse is required along with IT support and of course there is the time required by the physician leader. It should be compensated time. • Financial support from the practice and ASC. It will require $100,000 to $150,000 to establish a Q&V program with the majority of costs attributed to staff and physician expenses. • Reporting. Physicians must see the data results on an on-going basis. Only then will they know how they compare with peers and whether their performance is acceptable or needs improvement. Q: What are the criteria you use to measure quality in your ASC? • How would you rate the overall performance of this center on a scale of one to 10? Q: Are you able to negotiate quality measures with third parties? BO: Yes, we negotiated an at-risk quality contract with a large insurance company. If we exceeded national and/or registry quality benchmarks (number one through four above) by a certain percentage, we would receive higher payments which, in part, were designed to help offset the costs of our Q&V program. We are in discussions with other insurance companies. Q: Do they reward your practice for meeting quality goals and benchmarks? BO: CMS is requiring reporting certain quality measures under PQRS, with the threat of a professional payment reduction beginning in 2015 if those measures are not reported. Providers may report quality measures to CMS through a validated registry preventing a reduction in reimbursement and also receive a small bonus payment in 2014 of 0.5 percent of total Medicare Part B fee for service patient reimbursement. Beginning in 2015, there is no bonus payment for satisfactorily meeting PQRS quality reporting requirements but a potential 1.5 percent to 2 percent cut in 2015 and beyond for failing to do so. Q: Have you seen improvement in physicians meeting quality measures within your practice as a result of a quality program? BO: Yes. 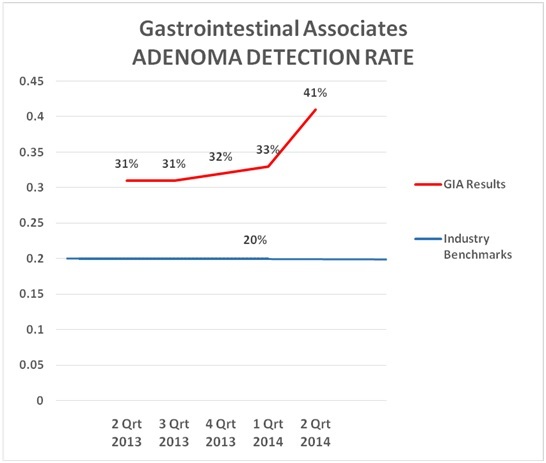 Since implementation of our Q&V program, we have seen the ADR increase for some physicians and therefore our group average ADR has increased. As others have said before, physicians do not like to be in the bottom percentile of a quality measure. They will improve their performance if data shows them performing in a lower percentile group. The following chart "says it all" for our group. The key for a practice to arrive at a place where data can be used internally and externally is to have your data submitted to and analyzed by a validated national registry.